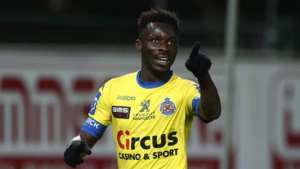 Ghanaian winger, Nana Ampomah is set to leave Belgian side Waasland-Beveren after an explosive performance this season. The 20-year-old is reported to be on the wish list of giants KRC Genk, who have been tipped to win the Belgian championship. ”I personally think this is my best campaign since I came to the Freethiel three years ago. In the remaining matches (including play-off 2, ed.) I hope to further improve my statistics," he added. "From three goals and six assists, I would like to go to five goals and ten assists. That’s not a bad thing for a player from a smaller club, I think. ”Whether my good form catches the attention of other clubs? Whoever plays well creates interest, that makes sense. But it is still early and I am still under contract for two years. Ampomah is still under contract with Waasland-Beveren until mid-2021.